In our latest refresh, our bass amp chart didn’t need much in the way of a rejig. However, we removed the slightly older TC Electronic BH250 and replaced it with the powerful new Hartke HD500 combo amp. When it comes to the differences between bass and guitars, there are many – from strings and pickups to tones and techniques. Of course, this also means bass amplifiers are a bit different from their electric guitar counterparts. However – similarly to guitar amps – bass amps come in a wide variety of shapes, sizes and flavors, and it is wise to know what you want before you take the plunge. To make things easier and to help you find the best match for your own setup, we have created a chart of what we consider to be the top bass guitar amplifiers on the market right now. We’ve searched all categories and have included stacks, combos and heads, as well as both budget and premium models. Let’s get started. All tube preamp section combined with lots of power at your disposal. A monolith of kilowatt power that will move serious air on demand. Balanced performance packed into a lightweight, compact, but also reasonably powerful head. Lots of power contained in a well balanced and great sounding combo. Cool compact combo offering 500 watts of power. Another capable budget wonder head from Behringer's Ultrabass series of bass amplifiers. Lots of tangible power packed into a well designed, compact combo cabinet. One of the best practice bass amps on the market right now. 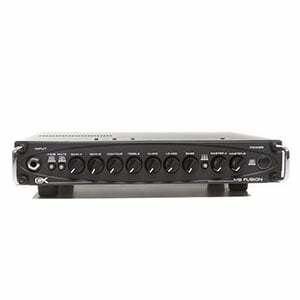 Gallien-Krueger is known for making niche solutions which almost always hit their mark. Their MB Fusion head packs a whopping 500 Watts of power, which wouldn't be all that fascinating if this head wasn't only 4 lb in weight. However, its light nature and decent power output are not what makes the MB Fusion so attractive. Gallien-Krueger has packed this thing with three 12AX7 tubes in the preamp stage. This gives you a very organic, natural sounding tone that only tubes can deliver. On top of that, you are looking at a very versatile control cluster that allows for a whole range of tone shaping. It's fair to say that MB Fusion is currently one of the best heads available. Ampeg’s SVT-7PRO stack that comes with their SVT-410HLF speaker cabinet is one of the hottest stacks on the market right now. With an impressive kilowatt output at your disposal, you can use this stack for serious stage work. However, the best thing about the SVT-7PRO is just just how versatile this head actually is. Not only does it feature an extended three-band EQ, but it also comes with a built in compressor. Sure, there are better stand-alone options, but this unit is more than capable of leveling out your tone. 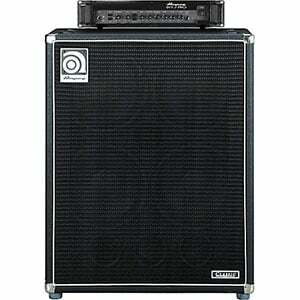 Speaking of tone, Ampeg has configured the speaker cab to be more focused on the lower end of the range. Combined with a decently sized port, this 4x10 cab rocks. Markbass Blackline Little Mark 250 was designed to deliver a quality tone to those who can live without massive power output ratings. Even so, its 250 Watts of RMS heat are perfect for home and studio use. This head comes with Markbass VPF filter as well as their VLE emulation technology. Combined with two levels of mid range controls, these feature form a powerful six-band EQ. Those looking for a lightweight, reasonably powerful bass amplifier that brings a good tone, will most likely find everything they need in Markbass Blackline Little Mark 250. This awesome head might not be worthy of serious stage use, but it is a potent package for just about any other application you could think of. Fender's Rumble 500 represents a no-nonsense bass combo that's packed full of power and practical features. It is relatively compact for what it is, and features a versatile four-band EQ. Among the less standardized features, you have a fully optimized drive section which allows you to tap into some sweet overdrive if you feel like it. The 500 Watts of available power make the Rumble 500 a solid choice both for those who need a good practice amp, as well as those who want something reliable to gig with. In terms of bang for the buck, this may be one of the best balanced combos on the market at the moment. Overall, you can't really go wrong with this one. The newest addition to the popular HD Series from Hartke, the HD500 combo amp packs a serious amount of power into a compact, lightweight package. The fact that it comes in a rugged case which is just 35lbs in total makes it very tantalizing to the regularly gigging bassist, especially as it boasts 500 watts of power and a very well-balanced tone. As we highlight in the complete review of the HD500, this power is delivered through two 10” HyDrive cones with a hybrid paper/aluminum construction for both punch and warmth. The controls make sound shaping very easy too. A great choice for experienced bassists. Behringer's Ultrabass series of bass amps has always been the safe haven for budget users. One of their latest additions to the series, the Ultrabass BXD3000H, follows the tradition set by its predecessors. However, this time around, we are looking at a pretty powerful setup with a lot of tone-shaping potential. On top of all that, the whole amp comes in at only 8 lbs. Among the interesting features offered by the BXD3000H, the 7-band graphic EQ has got to be the most prominent one. Aside from giving it a rather vintage vibe, the addition of a graphic EQ allows you to accurately dial in a pretty good tone. Overall, BXD3000H is a great option for budget users. Orange Crush Bass 50 is by far one of their most balanced models to date. This thing combines experience and lessons learned from Orange's flagship models, delivering a very tasty tone with just enough power where we can call it versatile. With a ported cab and a semi analog circuitry, you're bound to experience some of that punchy low end that's tight, powerful and well defined. On top of that, Orange has included a number of features that make the Crush Bass 50 that more flexible. By this, we mean the fully functioning FX loop as well as an on-board tuner. Perfect for home practice or studio use, you can definitely use Crush Bass 50 for light gigging as well. Vox Pathfinder series pushes the practice segment of bass amplifiers to a whole new level. 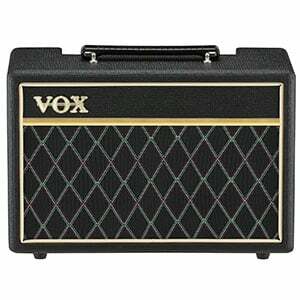 Featuring that classic Vox design, this compact combo represents a pretty simple yet capable solution. The amp delivers 10 Watts of power through a pair of 5-inch Vox Bulldog speakers. Despite their size, these transducers were customvoiced to provide a deep reaching bass tone. Pathfinder has proven to be a very good recording platform as well, allowing you to record some pretty awesome bass tones. On top of it all, it comes at a price that's just too good to ignore. In the standard Vox nature, they've also included a built-in overdrive section that allows you to spice things up when necessary. What do you go for? Head or combo? The general rule of thumb when it comes to choosing between a head or a combo is to go for an amp head if you are planning on gigging regularly. These tend to offer the most power for your money, as well as the flexibility to choose your favorite cabinet to plug into. An added bonus is that many venues will already have a cabinet, meaning you only need to take the head along – compare this to lugging around a big combo and you have a much better option for on the road. However, let’s not be harsh on combos. Unless you are regularly performing to a large audience, you probably won’t need the power most big bass heads offer (although some combos can certainly provide stage-worthy output – just look at the Hartke HD500 on our chart). Having the head and speaker in one box is also incredibly convenient, while combos tend to work out a lot cheaper than heads – you can buy a great bass amp for under $300. Plus, you don’t need to factor in the cost of buying a separate cabinet. So, combos will be the smart choice for many bassists. As we’ve discussed, buying a bass amp with the right amount of power for your playing is key. Too much, and you’ll never turn it up past 1 when playing at home. Too little, and your audience will never hear you. Generally, bass amps need more power than guitar amps. If you are playing at home – whether a beginner or just practicing – anything around 10 to 40 watts will be sufficient. However, if you are performing on stage to more than a small room, anything from 500 watts to 1000 watts will give you the volume you need for playing along with a drum kit and electric guitar(s). How much power you end up with will ultimately depend on your exact situation, who you are playing with, and where you are playing. The bass amps we’ve highlighted in the chart above should give you a taste of what’s out there and what’s worth your cash. Of course, there are many more on the market to choose from, but these offer a good snapshot of what’s popular at the moment. So get out there and read some reviews, watch some videos and try some out. Good luck with your hunt for the perfect bass amp! Not sure why the orange crush Is on there. Mine lasted 3 gigs and a few practices. Could never hear it during practice and I had the 100watt version. Also it got knocked and now the electrics are messed up. I play out of a hartke stack a410/&115 cabs & a 2500/head greatest sounding rig when setting are just right tell something else I like come along. Why isn’t Bergantino Forte, Mesa Subway or Darkglass with their respective speaker cabinets mentioned here? Those are truly the best of the best.